Last time at the butcher we bough a number of pork loins, really nice marbled as always! It can be a bit messy to fry them in a cast iron pan like we usually do, but to cook them in the oven like this is really convenient! Loin of pork for dinner. The pork loin was served with the Hasselback squash from the day before and the red cabbage salad as well as some sauerkraut. Don’t forget the click of butter on top as well! Loin of pork with garlic cloves and cayenne pepper. It’s very simple. Just put the meat in a oven ramekin and season with salt, pepper and cayenne pepper. Add some whole garlic cloves on top as well! 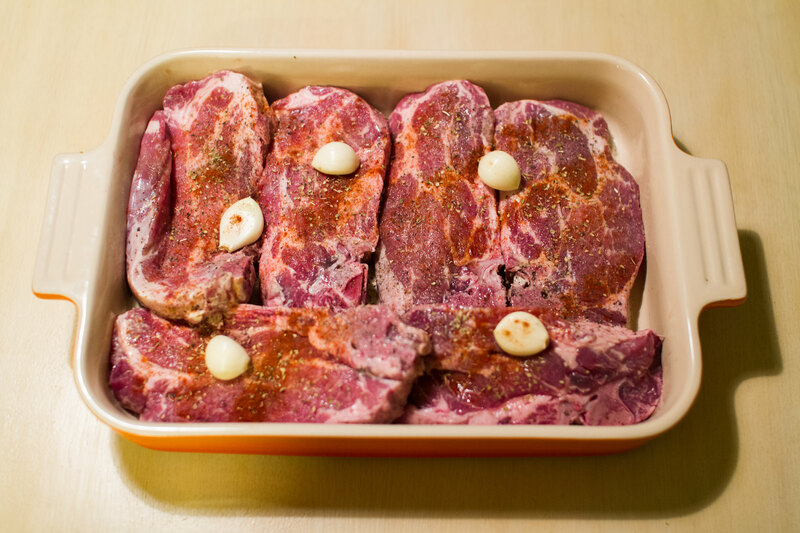 Place in the oven at 150°C and cook until the meat isn’t red anymore. 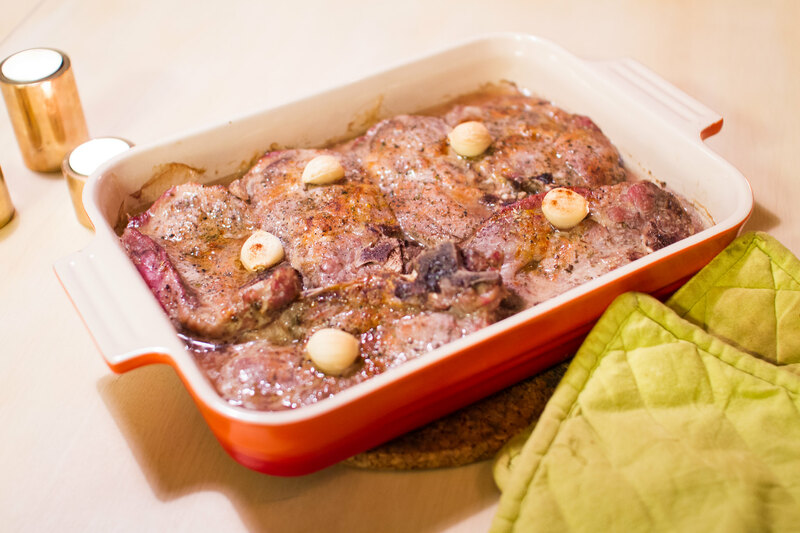 In the oven, it’s a small risk for the meat to become dry some the timing is not crucial. Loin of pork after being cooked in the oven. How delicious doesn’t these loin of pork look? So juicy and so much flavor! Not only from the seasoning but also from the meat itself since it is from free-range happy pigs. Dinnertime. Loin of pork, butternut squash, red cabbage and sauerkraut. An organic red wine from Algarve, Portugal was enjoyed to the dinner. An old classic from my (Magnus) childhood was the hasselback potatoe. It was a definitive Saturday dinner favourite for sure. 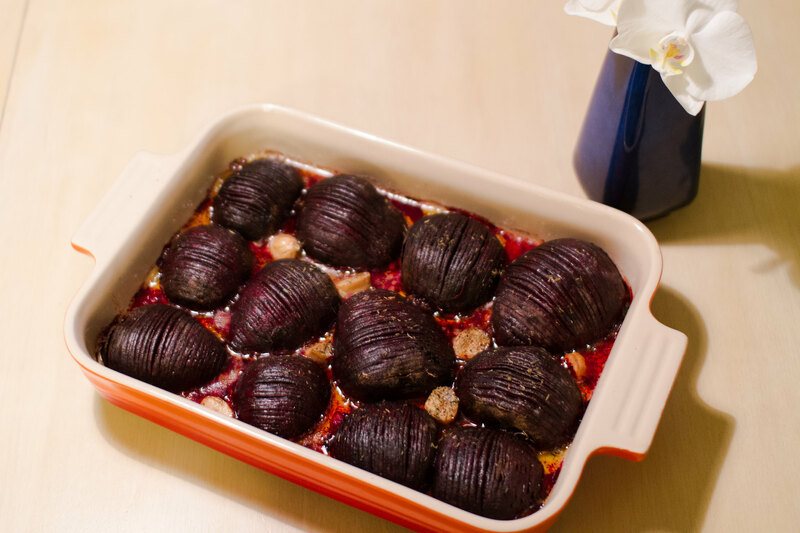 After going paleo I have however completely forgot about it and it has actually not been something that I have missed, but the other day I got the idea of doing a hasselback variation on beetroots. 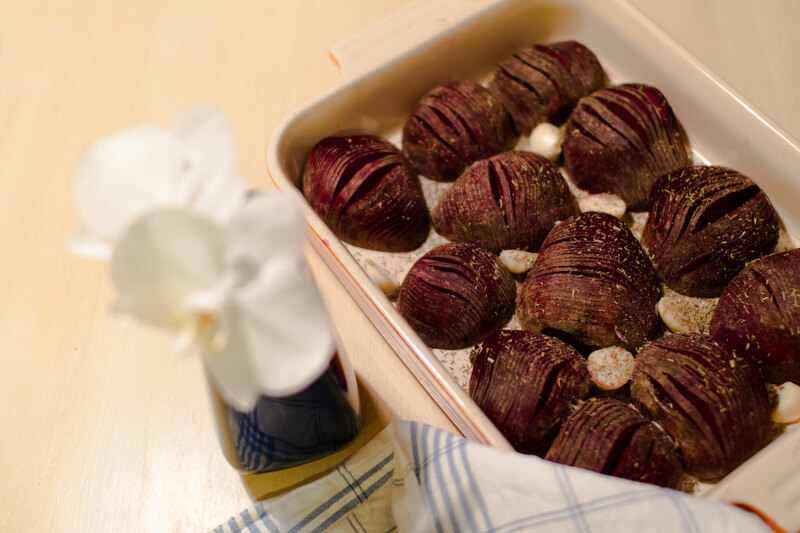 Hasselback beetroots seasoned and ready for the oven. The great thing with the hasselback concept is that the small cuts in the top are roasted and creates a nice crispiness that is otherwise hard to achieve unless one cuts really thin slices and cooks them like chips… An other nice feature is that the cuts also increase the effective surface of the vegetable which in turn means that there are more opportunity to expose the vegetable for spices or butter(!) to really get out as much taste as possible. Start by turning on the oven at 210 °C, then cut the beetroots in half. Next up is doing the hasselback cuts. After having done some hasselback potatoes in my days I have come across a nice and simple way of efficiently making the cuts. Pick a tree tool with a thin flat handle from the kitchen drawer (or wherever you have store your kitchen tools). Place the the beetroot alongside the flat tree handle. Use a sharp knife to cut down through the beetroot to the tree handle. 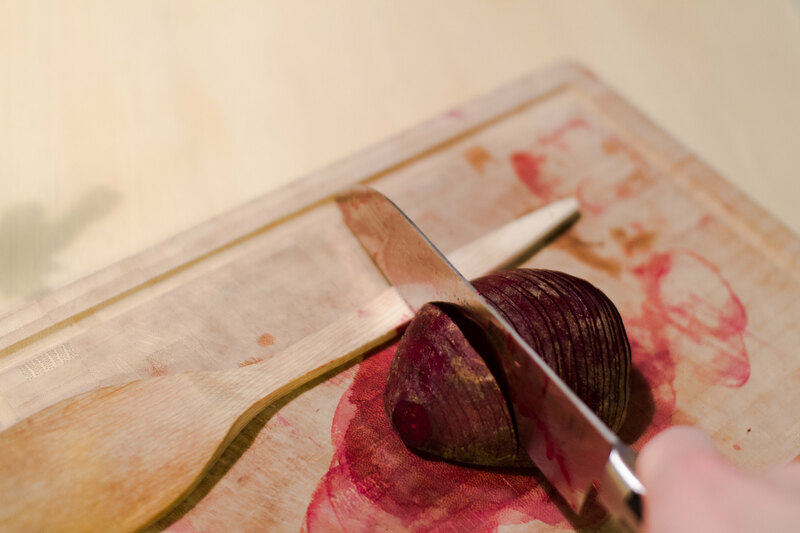 Make sure to keep the knife level with the cutting board so that you don’t cut through the beetroot the whole way. The tree handle is then helping to avoid cutting through the whole beetroot and creates a nice and even depth of the cuts. Using a flat tree tool handle as a support for the cutting. Next, when all the beetroots are cut place them in a ramekin. This time we added some chopped garlic as well. 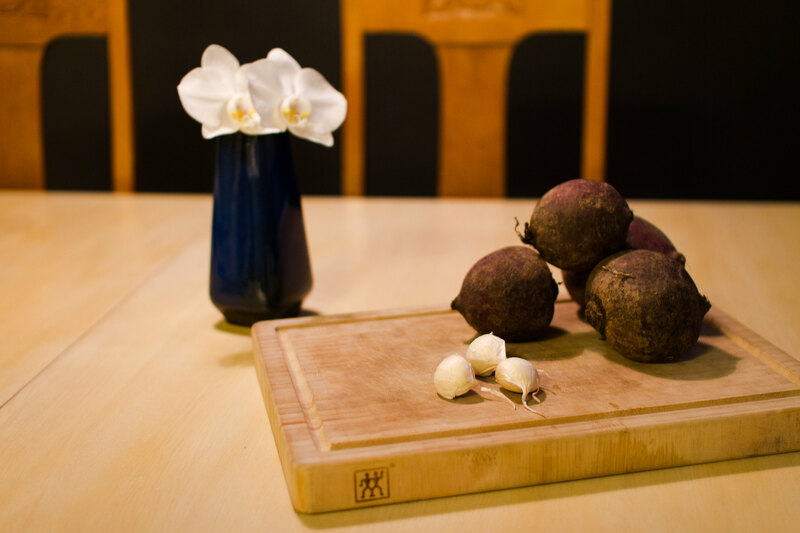 Then season richly with salt and pepper and top with a click of butter on each beet root half. Place the ramekin in the hot oven for roughly 45 minutes. 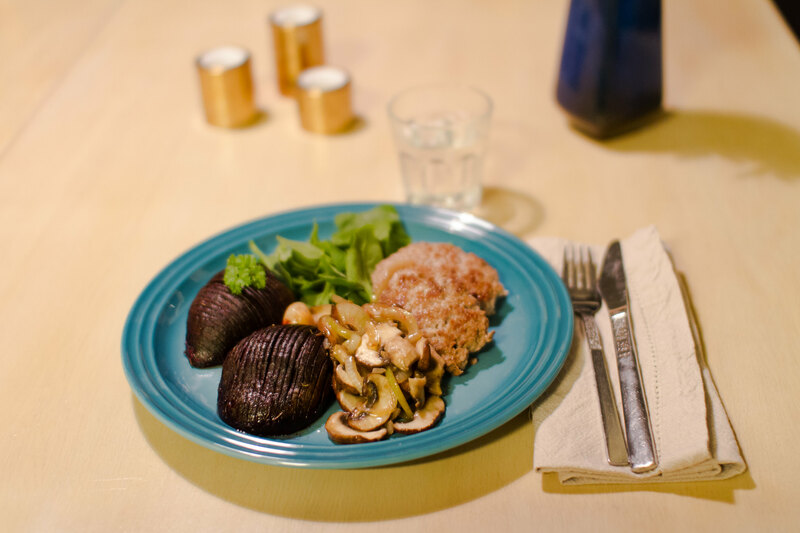 To go with the beetroots we made some minced meat patties with fried onion and mushrooms together with a small green salad. 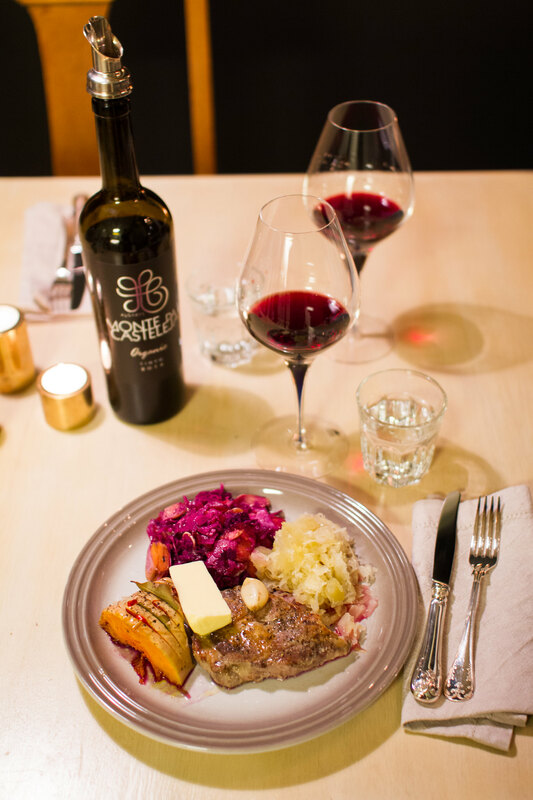 Dinner with hasselback beetroots and meet patties. Do you have any old time favourites that might inspire your cooking? Please let us know! As mentioned, during October I’ve been counting all my carbs and tried to translate that into how many grams of carbs each unit of insulin can handle for me. Time to use some math skills! In my phone I have an excel sheet with a list of food and corresponding carbohydrates per 100 grams. In column B the carbohydrate content for each food is entered and in column C I enter the total number of grams I put on my plate (measured with help of a kitchen scale). Then I get the total amount of carbs on the plate in column D and summed up to a grand total in the end. This is the easiest way I have come up with, a quick and simple carb calculator. I’m sure there is a lot of similar ones out there, for free or to buy, but why not make one yourself! It’s especially convenient to be able to enter your home cooked food in the list as well, for example the butternut squash soup. So basically what it says is that if the difference in blood glucose before and two hours after a meal don’t differ more than 2 mmol/L, then it should calculate how many grams of carbs I have eaten to each unit of insulin. Otherwise it should just give null as an answer since I’m not interested in that suboptimal outcome. I do this for lunch and dinner! Do you follow? Some skills in excel are needed, but the math is very simple! Unfortunately, as you can see in the yellow table, it’s not always the truth! It’s seldom the truth actually and the numbers also varies a lot between the days. The body is not a machine that runs on the same terms all the time and that is one of the things that makes diabetes type 1 a nightmare to live with. But this calculator can at least be used as a qualified guess instead of just a guess. 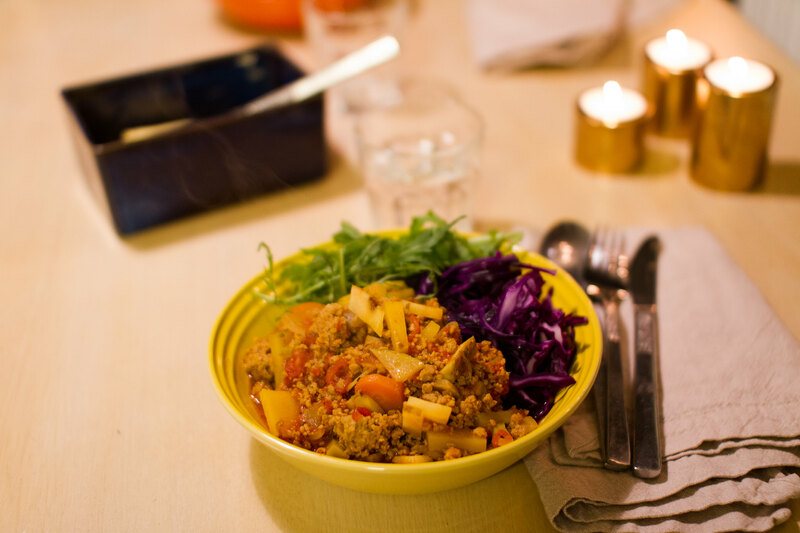 We had a good amount of minced pork meat leftover in the freezer, that was turned into a mincemeat sauce with homemade bone broth and delicious root vegetables. The sauce was served with steamed cooked red cabbage and some green leaves. Minemeat sauce and steamed cabbage for dinner. 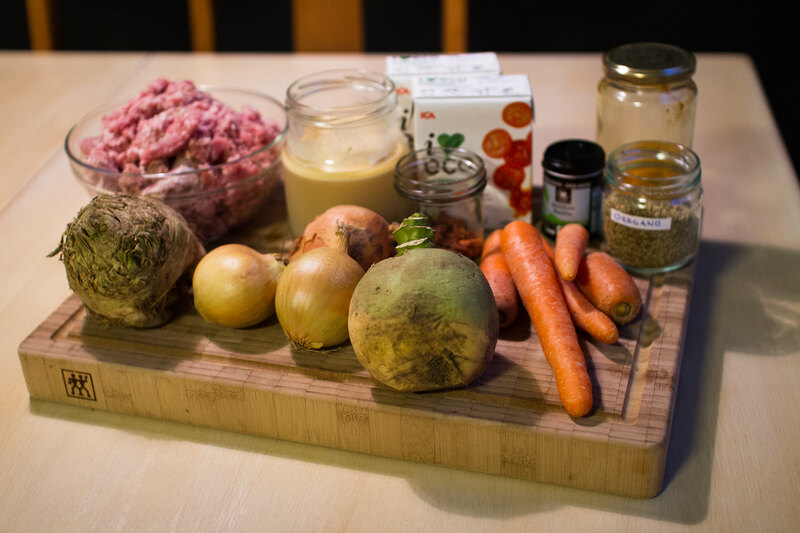 Ingredients used for the mincemeat sauce. Chop the onions and brown them in coconut oil. Add the minced meat and let it fry. Chop the rest of the vegetables into small pieces and add to the meat and onions. Add the bone broth, crushed tomatoes and all the seasoning. Let it simmer for as long as possible to let the flavors set, but at least until the vegetables are soft enough, which should take about 20 minutes. 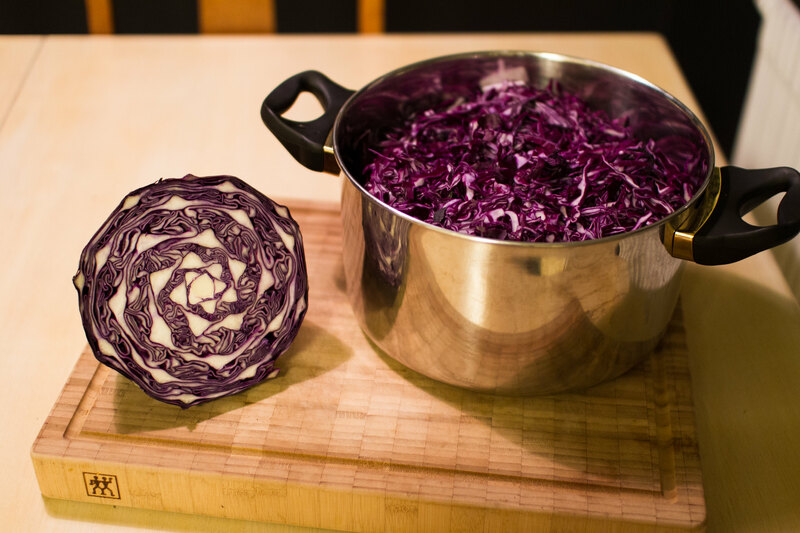 Red cabbage to be steamed. To the mincemeat sauce some red cabbage was steamed. At the bottom of the large pot is some water and a steam inset. The cabbage is steamed for about 5-10 minutes so that it still keeps some crunch but are soft enough to be a perfect combination to the sauce. 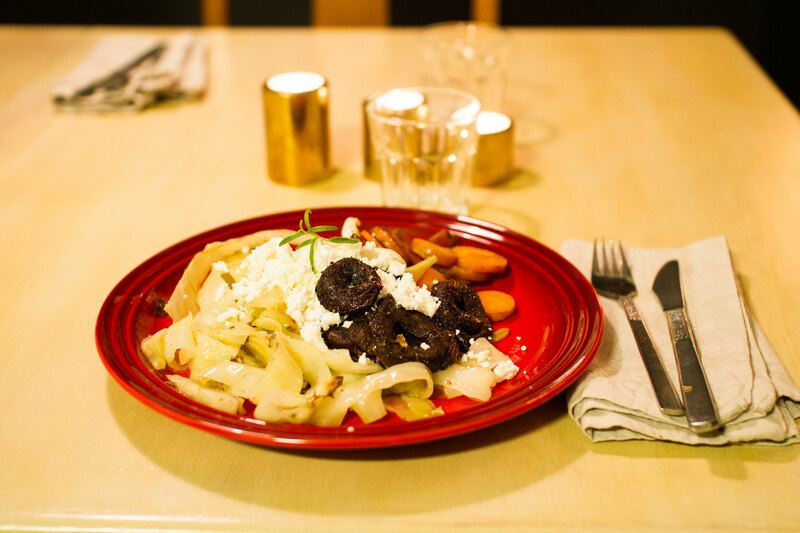 Time for some lamb heart again! Last time at the butcher’s Cecilia bought five of them. One we had that same week, two for the cats and two for the freezer, which we now defrosted and enjoyed. 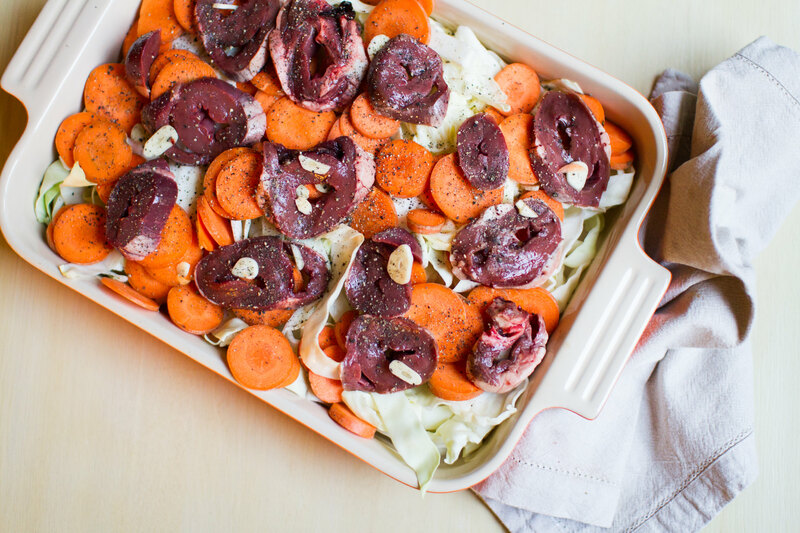 Simple mix of heart, carrots, white cabbage and garlic. Heart is a really nice piece of meat in and of itself. 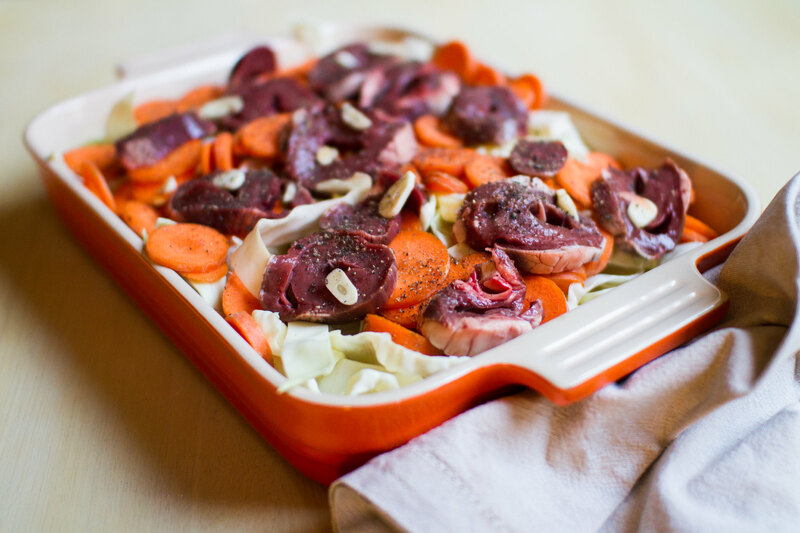 There is not much seasoning needed for it to still be interesting and enjoyable and the texture is also really appealing, compared to other organ meats… This time we made a really simple mix of cabbage, sliced carrots and garlic as a bed for the sliced heart to rest on. 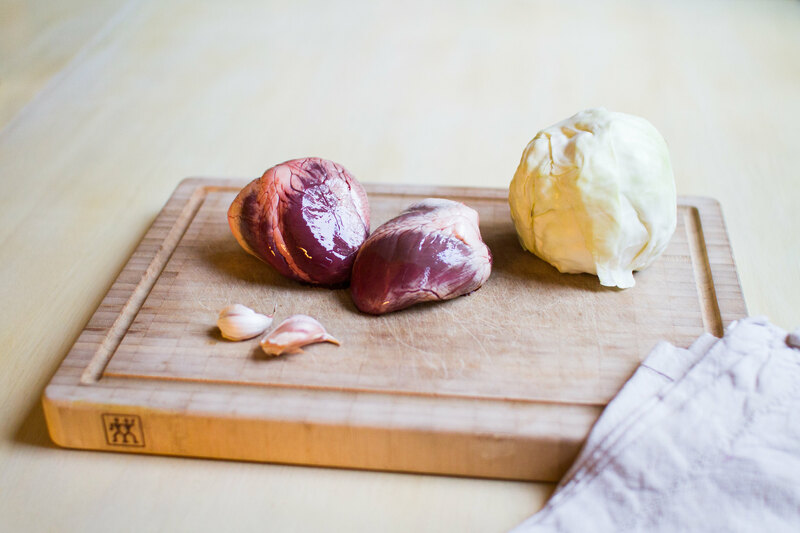 Lamb hearts, cabbage and garlic. The mix was seasoned with salt and pepper and put in the oven at just below 200 °C for roughly 40 minutes. Seasoning the heart and veggies before the oven. This was a really simple dish, but still really tasty. 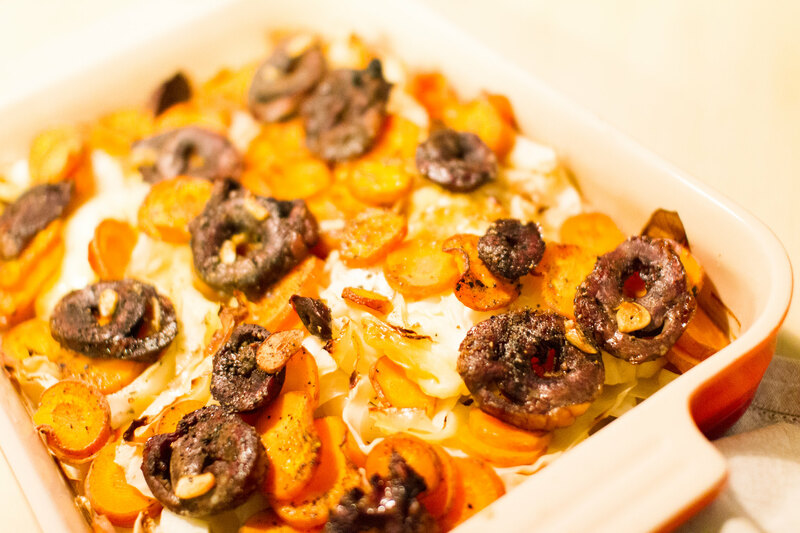 The carrots got perfectly al dente and crispy together with the lamb hearts. We had it with some feta cheese and butter and some olive oil. 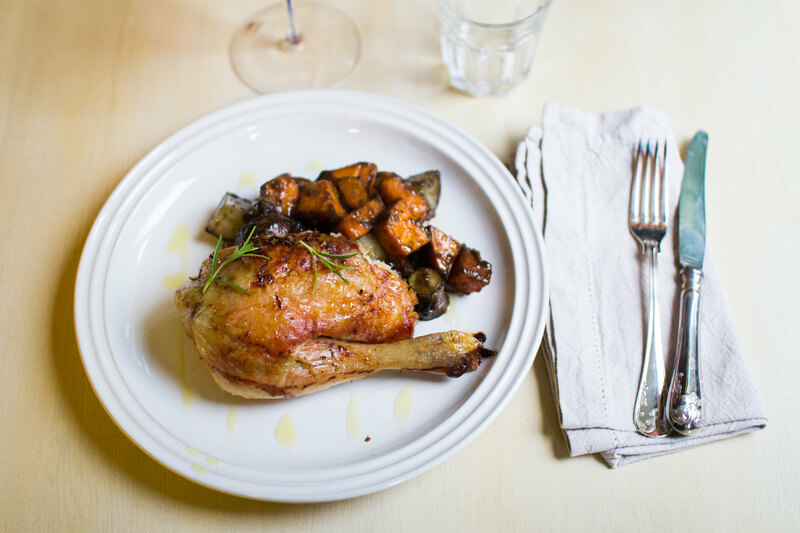 The past week we have had such crawings for chicken. Fortunately we also bought one last week so we figured it would be nice to cook it. With some planning we allocated almost four hours for the chicken in the oven. Before putting it there we however covered it with butter and seasoned it with lemon zest, fresh ginger and a branch of rosemary. 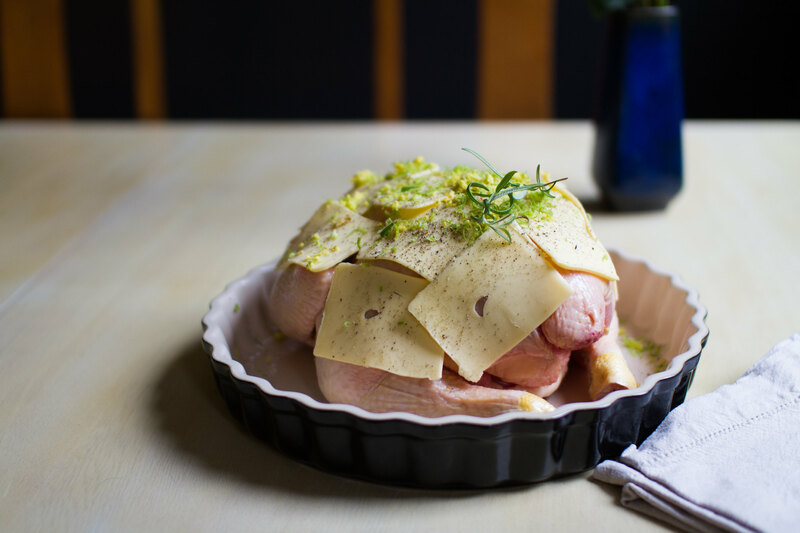 The rest of the lemon was stuffed into the chicken together with some garlic and even more rosemary. Next it was placed in the oven at 130 °C. Chicken ready for the oven. 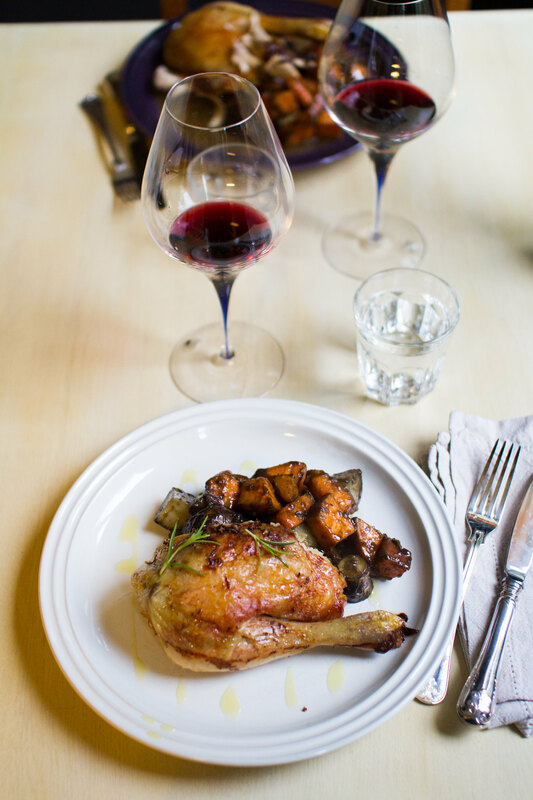 To the chicken we stir fried sweet potato and Jerusalem artichoke in some bone broth. 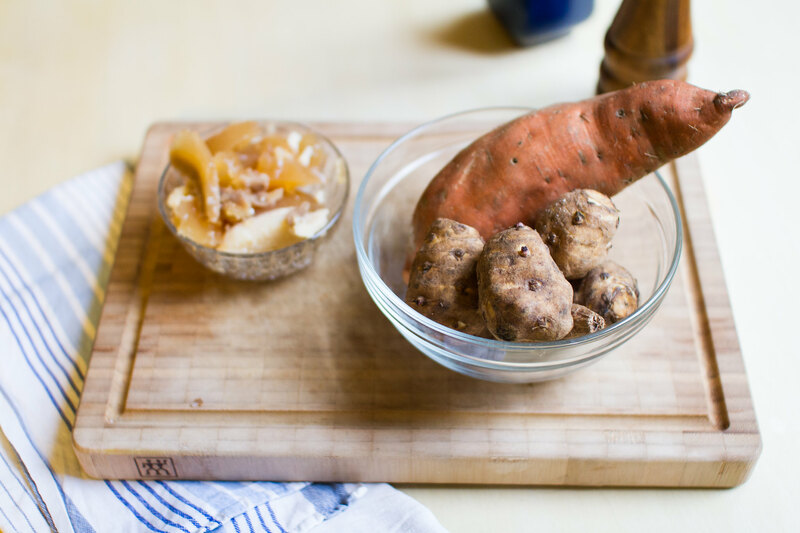 Sweet potato, jerusalem artichokes and bone broth for the stir fry. Leaving anything in the oven for a sufficiently long time at low temperature is by far the safest and easiest way of arriving at a perfectly moist and cooked piece of food. Be it vegetables, chicken or any other meat. Served sprinkled with some olive oil. It did maybe not turn out as pretty as we had hoped, but that did not affect the taste. Chicken skin must be the best thing ever, right? Such a perfect combination of all the flavours and all that healthy fat. We are really sorry for all those that remove the skin when eating their chicken. That is really a shame to miss out on that. Enjoying dinner with a small glass of wine. 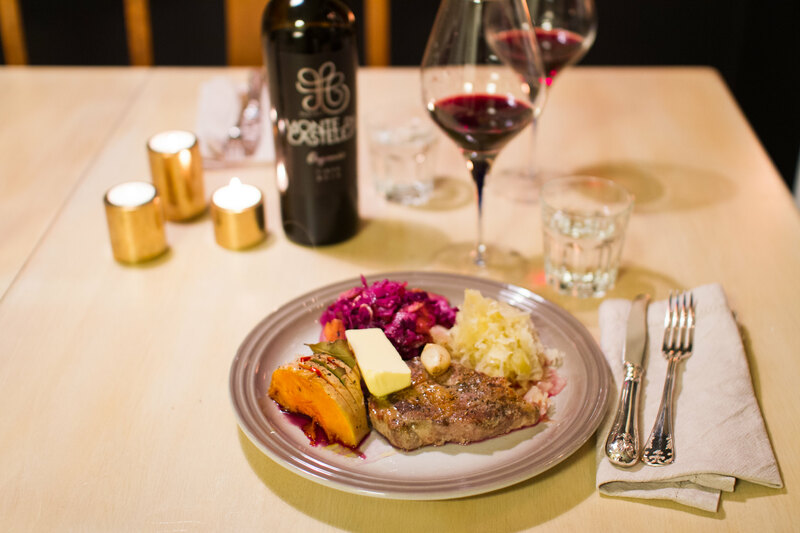 We fancied a small glass of red wine together with the food, just as a way of enjoying the flavours in the food even more. Before our walk to Gunnebo on Saturday we started the day with a brunch of coffee (of course) and some coconut pancakes. Brunch with coconut pancakes and coffee. Place a frying pan with some coconut oil on the stove on medium temperature. Mix the ingredients in a bowl and when the pan is hot pour the mixture into the pan to create 7 cm wide pancakes. Let them fry for about two minutes on one side, then flip them over and leave for another minute. 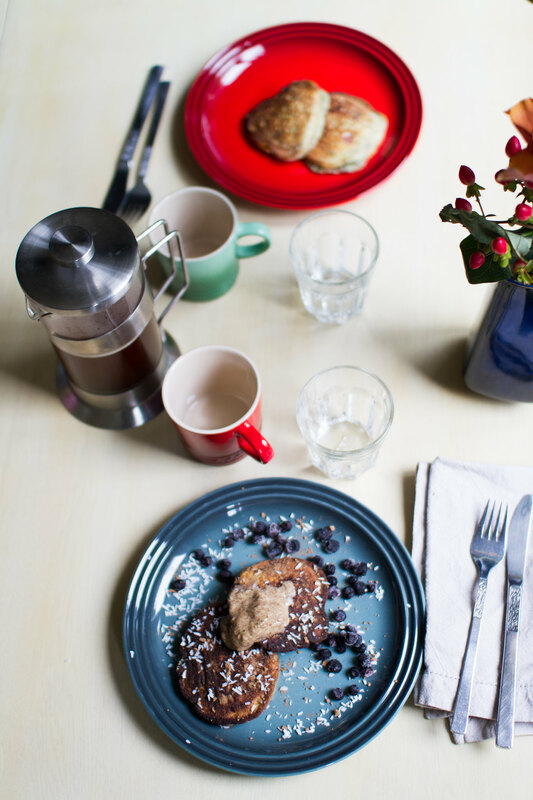 We used frozen raspberries and blueberries to create some extra tasty pancakes. Since the berries were frozen we had to fry the pancakes for an additional minute maybe, but when doing that make sure to keep the pan on reasonably low temperatures, as to not burn the pancakes. The pancakes ready to be eaten. 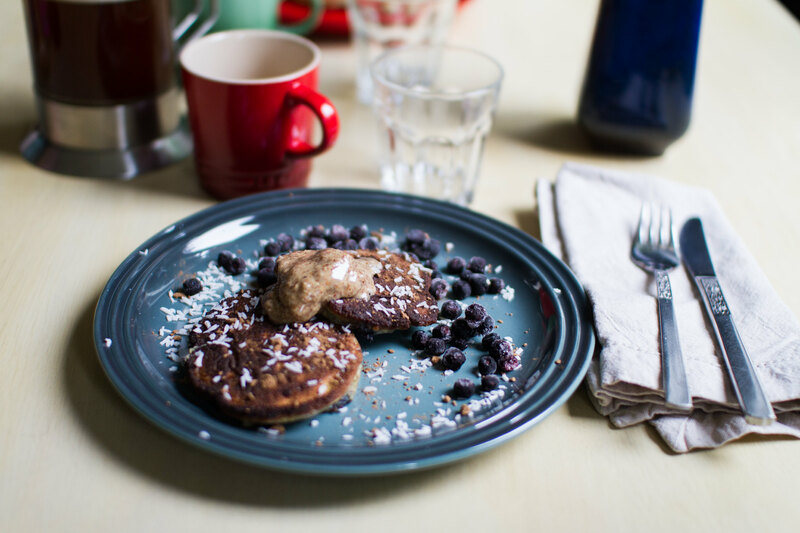 To the pancakes we had some more blueberries, desiccated coconut, almond butter and carob powder. It turned out to be a really great combination. 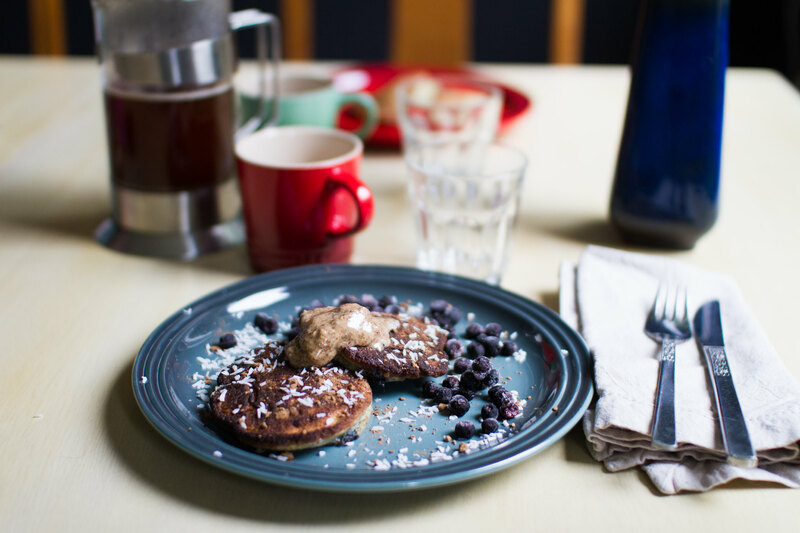 Pancakes with blueberries, coconut, almond butter and carob powder. 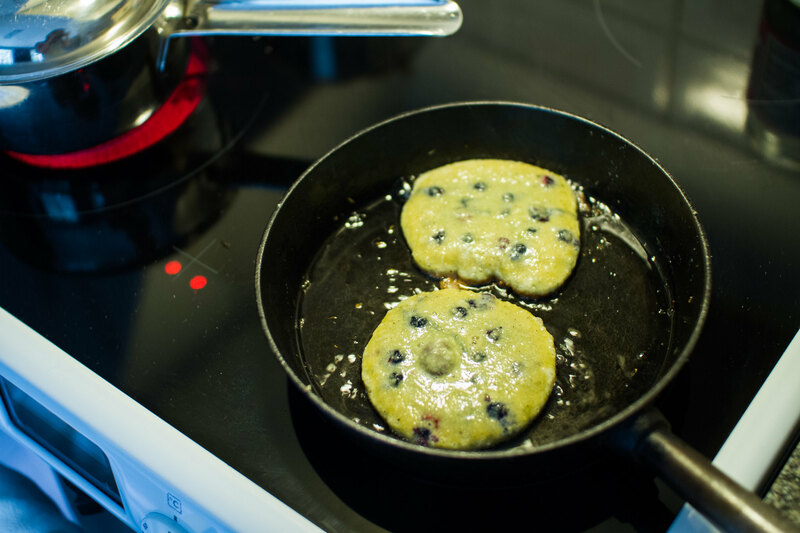 The pancakes might get quite dry, depending on the size of the eggs and the coconut flour, so one option is to make a mix of berries rather and heat them in a sauce pan and serve together to compensate for the possible dryness. In our case it was sufficient with the blueberries and the almond butter, but previous times making the pancakes we could definitely have benefited from some more berries.